Supreme Greens is a powerful Mega-Food formulation of organically grown grasses and vegetables, sprouted grains, blood purifying and immune enhancing herbs, and antioxidants synergistically blended with MSM (MethylSulfonylMethane), to enhance and preserve the radiating frequency of each ingredient. Supreme Greens with MSM is naturally alkaline, helping to balance your body's pH, while providing you with the vitamins, minerals, amino acids, and plant proteins you need for proper cell regeneration. The need for supplementation has never been greater than it is today. Our foods simply do not have the same nutritional value of years past. Plants and vegetables absorb 67 vitamins and minerals from the soil. However, a typical farmer will add only 3 nutrients back into his farming soil. Over time, this practice creates a huge nutritional deficiency in our daily diets. Supreme Greens with MSM and Risolubles helps you overcome this deficiency by providing you with the nutritional equivalent of 2 lbs. of fresh vegetables in every serving. All disease is in the blood and over-acidification of the blood and tissues is the primary contributor to disease and sickness. Yeasts, fungus, molds, bacteria and viruses need an acidic environment to thrive and grow. Modern daily diets and lifestyles are conducive to such proliferation and growth. Supreme Greens with MSM and Risolubles is naturally alkaline to help balance your body's pH levels for greater health and wellbeing. Supreme Greens with MSM has been improved . . . it is now combined with Risolubles® (a patented rice bran derivative) . . . providing more concentrated nutrition than ever before. 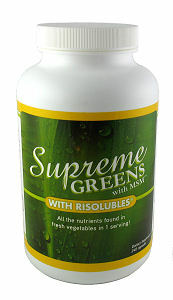 Supreme Greens with MSM and Risolubles has been discontinued. Sea of Greens a sea based whole food green superfood.  Click Here to learn how Sea of Greens® helps support overall health Sea of Greens® is a Whole-Superfood supplement, combining an optimal blend of sea vegetables and Freshwater algae.  Click Here to learn how Prostate Miracle® helps support prostate health. 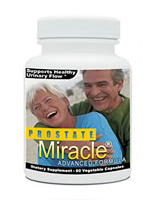 Featuring all natural beta-sitosterol, Prostate Miracle® is trusted by thousands and has a MONEY BACK GUARANTEE! Diabetes Daily Care® a Unique, 100% Natural Formula, which helps support healthy blood sugar. Diabetes Daily Care® combines the extracts of Cinnamon Bark, Banaba Leaf, Fenugreek, Gymnema Sylvestre and Mamordica with Alpha Lipoic Acid, Chromax® and Vanadium. There is no other natural diabetes support formula out there which contains all of these ingredients together in the generous amounts that Diabetes Daily Care® provides.  Coral Calcium "Marine Plus" is based on the Coral Calcium formula Bob Barefoot used to sell on the Shop America TV Infomercial, but serving size has been upgraded from 1,000 to 1,500 mg. and still comes in a 90-count bottle. Each 3 capsule serving contains 1,500 mg. of "marine grade" Coral Calcium from Okinawa, Japan + 816 iu's of Vitamin D as well as vitamins A, B, C & E + Aquamin, Cesium and folates. Click Here for more info about Bob Barefoot and Coral Calcium.  Click Here to learn more about Cholesterol Metabolizer® a 100% natural, formula which helps support healthy cholesterol levels. Is the only product which contains beta sitosterol, beta glucan, soy isoflavens and Chromax® (chromium picolinate) combined together in one formula.  Click Here to learn about Vitamin D and it's role in building and maintaining good bone health. Adequate calcium and vitamin D throughout life, along with physical activity, may reduce the risk of osteoporosis in later life. 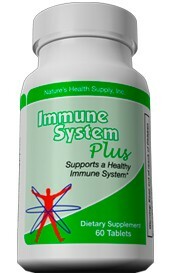 D MAX contains a whooping 5,000 iu's of Vitamin D3 per capsule.  Click here to learn about vK2® which is the perfect companion product to Dmax. Unlike most Vitamin K formulas, vK2® provides both MK-4 (5 mg.) AND MK-7 (100 mcg.). The amounts provided are not only generous, but are also the most pure form (99% trans) and of the highest quality available (NOT from China).